About 10 years ago, I wrote this piece on deconstruction, words, meaning, and text. It is pretty common sense stuff, but academics get seduced by concepts and philosophies that better fit what they wish to be true instead of what they know to be true. And so we get folks like Foucault and Derrida who are so praised on the modern campus. "Deconstruction is inventive or it is nothing at all..."
Reading is fundamental, went the old slogan, trying to get more kids to read and more people to pick up a book. What is fundamental about reading, though, the mere act of seeing and understanding words? Finishing a project like reading an entire book? Or does it mean the purpose and ideas of the words, what you learn and understand and grow from reading? Any time someone reads anything of consequence, they are introduced to ideas, situations, discussions, and events that they might not have thought about or been confronted by before. It is the substance of the books that is significant, expanding our education and understanding and teaching us the things that great minds and creative hearts have laid down in the past. Great thinkers of today are only that way because they've studied even greater thinkers in the past, who stood on the shoulders of great men. This continuous passing down of knowledge and information is critical to growth and advancement, it is the lifeblood of civilization. In recent decades, however, this has stagnated. People know less about what has gone before and especially what men and women thought before than ever in our history in the civilized West. Rather than knowing what great thinkers had laid down for us to learn in the past, we're at best hearing recent pundits and coming up with our own ideas, which are feeble echoes of the past. This, combined with the rejection of books as boring and slow has been corrosive to our shared understanding of the past and the wisdom of those who came before. There is another contributing factor, however, and in some ways it is far more deadly and influential. Some do read the past and study what was said and thought about before, but rather than thinking about what these writers said and meant, they think about what they mean and what they think the writers meant or said. This is a critical difference. Let me use a familiar tale for an example, this being the Christmas season: Luke, chapter 2. Now there were in the same country shepherds living out in the fields, keeping watch over their flock by night. And behold, an angel of the Lord stood before them, and the glory of the Lord shone around them, and they were greatly afraid. Then the angel said to them, "Do not be afraid, for behold, I bring you good tidings of great joy which will be to all people. For there is born to you this day in the city of David a Savior, who is Christ the Lord. And this will be the sign to you: You will find a Babe wrapped in swaddling cloths, lying in a manger." And suddenly there was with the angel a multitude of the heavenly host praising God and saying: "Glory to God in the highest, And on earth peace, goodwill toward men!" So it was, when the angels had gone away from them into heaven, that the shepherds said to one another, "Let us now go to Bethlehem and see this thing that has come to pass, which the Lord has made known to us." And they came with haste and found Mary and Joseph, and the Babe lying in a manger. Now when they had seen Him, they made widely known the saying which was told them concerning this Child. And all those who heard it marveled at those things which were told them by the shepherds. But Mary kept all these things and pondered them in her heart. Then the shepherds returned, glorifying and praising God for all the things that they had heard and seen, as it was told them. This is the basic Christmas story, which is familiar to most, although fewer than in the past. This is why we have Christmas at all - the date is a bit off, it likely happened in the Spring, but at this point that is irrelevant. This is a short tale, two paragraphs long. For the purposes of this essay, whether it is historically accurate or true is irrelevant, that is for another time perhaps. For now, all that is of essence is the meaning and purpose of this text. In this context, there are two basic ways of reading this - and any - text: what the writer meant, and what you think it means. Following the concepts of writers like Jacques Derrida and others, many especially in the academic and literary community have taken up the second as their primary method of reading. I say primary, not only, because some things they take at face value like warning labels and newspapers. The idea is to take almost every piece of literature or writing and apply one's own worldview, perspective, or "narrative" and view what is said and why through that narrative. Let me give you a few examples to make this more clear. Note, these are exaggerated for effect. The agrarian peoples of the ancient middle east were typical of the time, with absolute rulers controlling every aspect of the lives of workers. We see Joseph here, a carpenter, an honest proletariat who works with his hands. He is wrested out of his life in Nazareth by the bourgeoisie and forced to the village of Bethlehem for registration, a simple and important step once revolution has freed the working classes, but under the hands of the oppressive ruling class a tool of tyranny. Joseph and his young bride are unable to secure lodgings at an inn, typical of the many simple ways that the working classes are oppressed by the bourgeoisie. The land owner gave an excuse of not having room, but he clearly had a fine suite of rooms and comfort at the expense of even the people he called customers. With so many people demanding rooms, no doubt this oppressive land owner took advantage of his power and charged more and more for each customer, forcing their hard-earned money out of their meager pockets and thus establishing is power even greater. The political struggle could not be more clearly expressed. A visit from shepherds is the only bright spot we have, we're told it is because of some angelic vision, but no doubt this explanation merely covered the true purpose: a revolutionary council. The shepherds who worked in the fields for little pay and much danger suffered in the cold for fascist land owners, exerting economic force on them. With this convenient excuse, they visited Joseph and Mary and formed a plan for a new king to come to their land, a child that they would raise with revolutionary ideals and plans for how to remake the land, throw off the yoke of oppression from both the Roman invaders and the proletariat ruling classes. As we all know, this sadly ended in death and misery for all involved, a king is no answer to fascist oppression. Mary, unwed and pregnant, faced a difficult choice: leave her husband as was the proper thing to do at the time, or bring shame on him and corrupt society through her selfish teenage inability to control her hormones. Mary's husband was patient though, he embraced the pregnant teen and tried to make an honest woman out of her. Mary and Joseph went to do their patriotic duty, to pay taxes and register with the government to demonstrate their allegiance to the flag. In Bethlehem, however, Mary was ready to have that baby, and since in those days there was no Social Security to drain the pockets of hard working citizens, she would normally be able to rely on friends and neighbors. In this case, however, she was in a distant town and knew no one around. Thankfully she had a good old fashioned education and knew what to do, and although a booming economy made it so there wasn't room even in the little town's inn, Joseph was a good entrepreneur and found a way to work around the problem. The local stable would do, and in that rustic setting, a baby was born, perhaps to later do his patriotic duty and serve in the Roman army. Local shepherds who were working a night shift turned out to be less than dedicated to their work, and showing little personal responsibility or loyalty to their employers, used the excuse of a birth in the stable to abandon their sheep. Angels would keep them, no doubt, because there is no criminal class to prey on the weak, requiring the strong arm of the law and prison time to hold them away. Sadly despite their best efforts, society's corrosive influence led Jesus to a bad end. His education - no doubt a public school - and the local media were more powerful than parents, and his mother was probably too permissive. Jesus a shiftless hippy with no job, no possessions, but a group of followers who tried to build some kind of Judean commune. In the end, just capital punishment was what he faced for his many crimes against the state. Thousands of years ago, we see the superstitious reliance on gods and supernatural events to try to explain things that happened. Although this is but a few millennia ago, evolutionary process inexorably has advanced modern man, society, and our understanding beyond these simple people and thier ignorance about life and biology. A woman becomes pregnant and cannot explain it - what is her response? It must have been a holy spirit, some divine visitation. We now are evolved enough to know that even casual sexual contact that any teenage couple, even unmarried in the dark ages of Hebrew culture at the dawn of the Current Era can transfer enough sperm to cause a pregnancy, but in those ignorant times, pregnancy was largely a mystery, a visitation by gods to grant fertility. As you can see, the culture at the time was so unevolved and unsophisticated that a pregnant girl was turned away from the inn - no doubt due to simplistic moral concepts that bound and damaged a culture. As a society grows, it begins to reject moral ideas that in the past were needed to bind a civilization together and keep it from chaos. A more evolved people need no such rules and laws. 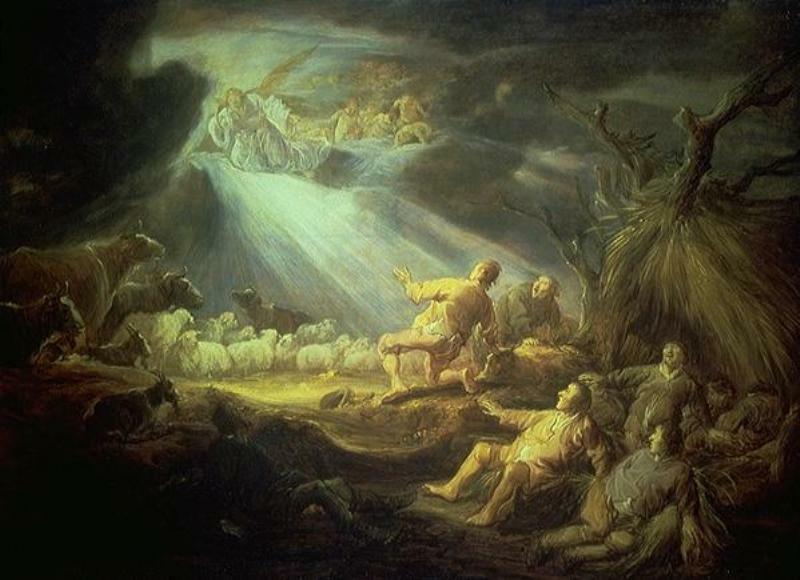 The shepherds working in their fields experienced what they considered a visitation by angels, but what was it? Rye is known to have caused mass hallucination by those who suffer from St Vitus' Dance - eating moldy rye bread and being afflicted by ergot. Perhaps it was this sort of effect that the shepherds suffered from, or perhaps they heard about the girl's "divine" pregnancy and concocted a mystical tale to add them to the excitement. A shepherd would have little education or knowledge and thus in a time of unevolved, unsophisticated superstition would be more likely to embrace such a tale, even embellish on it. In simpler minds, this tale might even be believed, especially if it was combined with some stellar event like a supernova seen for weeks even in the day sky. As our minds, education, and culture evolves, we can move away from this sort of superstition to a more clear understanding of events that does not rely on gods and angels. We see in this story the oppressive culture of the ancient middle east, with a Womyn being a pawn in the games of gods and men - even the angels sing about how men shall have goodwill, that men will find peace on earth. A teenager, Mary is trapped by Her pregnancy, likely caused by Joseph's irresponsible need to slake his lusts at her expense. A story is concocted by the disempowered Womyn to save face in a society that condemned a Womyn's pleasures and sexual acts while ignoring the men's brutish behavior. Yet through all this, we see Her conquer and triumph, giving birth to a child in the worst of circumstances, and watching all She saw. What is the final lesson of this tale? Mary, who alone among the thuggish male oppressors around her watching and treasuring in her heart all that she saw and learned. For in that time, a Womyn had to use what she learned to survive, she had to keep Her eyes open, use her wits and her wiles to have any status or power. While the men plodded mindlessly through life enjoying their dominance and unquestioned patronistic authority, a Womyn had to be smarter, more observant, and more thoughtful. This story is a triumph of the little guy, a repudiation of prevailing morality, and an example of how the poorest and disempowered among us require assistance and a hand up. With a tyrant in charge of the area under the invading Roman rulers, Joseph had little choice but to take his young wife to Bethlehem to register for the census, and thus taxation. Unlike Bush, Joseph was a successful businessman, a carpenter, but with this meager earning could hardly support a sudden family, but he was a good man and against popular culture of the time did not care if his wife was pregnant before marriage. Who can deny that teenagers will be teenagers, and although owing to the times a story of some "spirit" visiting was invented to explain her growing baby, we all know what really happened between those two! Mary chose not to have an abortion, and although Joseph may have been gay, at the time he had little choice but to put up a front of an ordinary life. We can see later on the influence his father's possible difficulties had in Jesus' lifestyle choices. Without a safety net, Mary and Joseph could not afford medical care, as is so often the case today where almost 50 million people are without healthcare, leading to tens of millions of homeless on the streets due to Bush's tax cuts for the rich and bloody war based on lies. When they reached Bethlehem, Mary was due, but despite this condition, the heartless businessman who owned the Inn turned them away. No hospice had been established, but the local stable would do for one night. Mary became a symbol, the Rosa Parks or Cindy Sheehan of her time. Facing difficulty, although not as bad as losing a son to a pointless war for oil like Mother Sheehan, rallied local people to visit her and think about what changes could be made for the poor, minorities, and women who are always hardest hit. When baby Jeeeesus was born, he was born in a stable, how many times in your life have you found yourself in the stable? A lowly place, with animals, without anything, you are at the low point in your life. Perhaps you've been using drugs, perhaps you've been SEXually active with someone, perhaps you struggle with some dark secret sin. In this stable of our lives, we need Jeeeesus, we need to find Jeeeesus and have faith. Do you have faith? Do you know that faith can help you through those darkest times? Missions cost money, and all the work we do here, well, it takes money. You can see Joseph did his part, he took his whole family to Bethlehem to be registered in the census, yes he did, and he did it because then he could pay his taxes. Well Jeeeesus wants you to pay your taxes to the church, and this ministry needs those taxes. That stable you find yourself in, it's never going away until you exercise your faith, you can see at the bottom of the screen the number to call, give generously. Let's have a number, do you think you can sing something for us, Agatha Toomuchmakeup? I could keep this up all day. Seriously I could, every viewpoint has some way that they can take any text and make it fit what they think about and want to say. For some, this is inescapable, almost like a mania where they force everything to fit into their predisposed way of looking at the world. This is what compels radical leftists to bring every discussion, every topic, every news item into yet another rant about President Bush. You probably know other people who do the same thing with a different topic: their job, their kids, their hobby, what have you. The problem with this approach is that when a book is written, the author usually has a point, and knows what they really meant when they wrote it. The writer almost always writes understanding what they are trying to say and usually why. 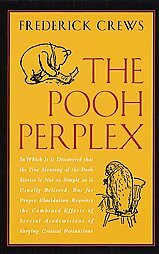 You can read stories about Winnie the Pooh and get almost anything out of it, the book The Pooh Perplex does exactly the kind of thing I did above with stories about Pooh. Books like the Tao of Pooh try to jam the simple children's story into a philosophy and teach things from it. To some extent this is fine: many different lessons can be taken from any great work of literature, or even just a great children's story like Pooh. Pooh did teach some simple lessons and give a viewpoint about life that A.A. Milne taught his children, likely without even meaning to. The problem is when you violate the meaning and intent of the writer. In some cases, this can be difficult to determine (some books are written deliberately like this, most poetry is very cryptic). In most cases, however, the meaning is fairly plain and even can be determined by other writings and statements by the author. For example, the US Constitution was written extensively about, the writers were very plain about what they meant and why in sources such as the Federalist Papers. Rather than jamming your viewpoint into what you read, you should take from it what you can learn and try to remember what the writer was trying to say. Why? Because if you do otherwise, you aren't learning from the text. Remember, the greatest benefit of reading is exposure to new ideas and thoughts and great concepts in the past. If you impose your thoughts on what is being said, all you are doing is confirming what you already think and want to believe. You learn little to nothing at all, and the exercise is more masturbatory than intellectual. Reading men like Locke and Socrates is only enlightening and helpful if you're willing to take in and learn what these men have to say, not what you want them to say or how you care for them to have stated something. Why did this system of reading start, and how much has it infected our society (I use infected rather than influenced advisedly - it is pernicious and damaging, and was not a process of leadership and influence)? That's the meat for another essay, but suffice it to say that this enables an ideology that rejects any absolute meaning and truth to flourish in the very realm that truth and meaning should reign supreme: academia. Taking a literature class today is a festival in this sort of imposition of meaning. When news is reported, rather than the bare reporting of events and facts, sometimes reporters take this idea of narrative interpretation to heart and give the lesson they learned or want others to learn. Instead of news, you're getting opinion. If this happens in an editorial, column, or blog, that's fine. If its front page news... that is a problem. When you see an explanation of an event, when you read something, keep this in mind and how it affects what you read. Consider it when you hear a professor talking about deconstruction and meaning, think about it when you read a news story about an event. Forgive me for showing some common sense, but this is a clear statement of intent and meaning. Luke says "here's an eyewitness account of things happened, so you can know they really happened and are true." Luke is writing an account of events for a friend, to demonstrate their veracity and validity. So what is this about? 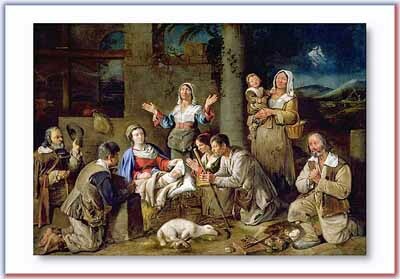 Simple history of events: Jesus was born to Mary in a stable because her husband took her to Bethlehem for a census, and there was no room in the inn. Shepherds visited them to see what all the fuss was about. Luke records events that could be considered fantastical or miraculous and thus dismissed by many, but his purpose is to be factual - he wrote these down because he believes them to be true and accurate. So he tells about a visitation from God to tell Mary that her pregnancy is from divine sources and for a magnificent purpose. The sky explodes over Bethlehem with angels who cannot contain their joy and amazement, they sing an anthem and say "you will NOT believe what God is doing now!" The purpose is evangelistic - to tell about spiritual events - and to fulfill prophecy, the purpose is to tell about Jesus Christ and the circumstances that showed this birth was far more than a simple pregnancy and delivery in a stall. Not only was the king of kings born, Luke wants to tell us, but he was born in the humblest manner possible, to the simplest people. That in its self says enormous volumes just in a few lines. So what about those other, previous attempts to interpret the text I quoted? Are they wrong? In a sense, yes: in that they are reducing the whole into some valid concepts that can be gleaned from the text. Luke is relying on Mary's wisdom and observation for part of his tale, he states he used eyewitness accounts. The coming of Jesus is portrayed as being for the weak and downtrodden rather than the rich and powerful - in a spiritual sense, primarily. Joseph was a responsible and good man who worked hard and was a good citizen. Each of these interpretations takes a shred of truth and exaggerates it to eclipse or destroy the rest. That's what makes this sort of challenging: the grain of truth. All good lies are based on some small amount of truth, they have enough truth in them to be plausible and believable, buried in a texture of invention and deception. Make no mistake, to bury the plain meaning and intent of the writer in a pile of invention and distortion to fit your worldview is a lie. Want to know what a book means and is trying to say? It's easy. Read it.